The Dior Giveaway is now closed. Thank you for participating. Winners will be announced in due course. Week 2 of the My Women Stuff 2nd Anniversary Giveaway sees a sweet generous gift courtesy of Dior cosmetics! Dior has been very supportive and have kindly sponsored one (1) 50ml bottle of the new Limited Edition Dior Addict Shine perfume (Couture Collection) worth RM218 that is just out at the counters. Just launched in March 2009 you’d be one of the first few to own this lovely scent. For an additional entry, subscribe to receive my feed by email (you can fill up the box in the header above or below this post – make sure your email address matches the one in the comments and make sure you activate your subscription). If you have already subscribed, there’s nothing more for you to do! The Dior Cosmetics giveaway runs from now until 12 noon 14 March 2009 (+8 GMT). Comments will then be closed and a winner will be picked at random. All winners of the Christmas and Valentines Day giveaways are excluded. Lets let others have a chance eh? You are free to promote this contest in any manner you wish e.g. blog etc. :). This Giveaway is open to readers with a mailing address in Malaysia only. The winner will be chosen at random based on the comments below. Prizes will be sent by me. Only 1 comment please. Repeated offenders will be banned from future giveaways. 1) I want to shine with Dior Addict Shine because nothing makes me feel more radiant and confident than a splash of floral scent. 1. I want to shine with Dior Addict Shine because I’ve always had a soft spot for well designed perfume bottles. Not to mention, I’ve got a big event coming up soon! 1. I want to shine with Dior Addict Shine because it is about time for me to shine after all these stressful hiatus and nonsense going on in my life. 1) i want Dior Addict Shine because my little brother decided to spray the entire contents of my armani perfume down the toilet. 1. 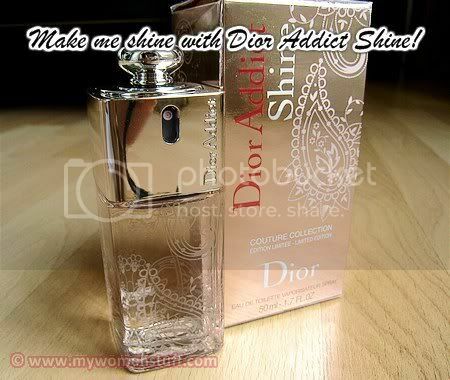 I want to shine with Dior Addict Shine because I am so dull and shineless lately, hehe. Besides, who doesn’t want a couture? 1. I want to shine with Dior Addict Shine because after all the time and energy I sacrificed for the family, its MY time to shine and do my thing! 1) i want a to shine with Dior Addict Shine because i cannot afford to shine with this shining Dior Addict. sorry! i accidentally press the submit comment! 2. Dior Addict High Colour lipsticks. 1) I want to shine with Dior Addict Shine because it is the secret weapon of my beauty. 1. I want to shine with Dior Addict Shine because I feel more confident when enveloped in a vibrant & mesmerizing scent, which allows my inner personality to shine through. 1. I want to shine with Dior Addict Shine because it will definitely guaranteed me to outshine the others. 1. I want to shine with Dior Addict Shine because I don’t want to just blend in, but to stand out and SHINE! 1. I want to shine with Dior Addict Shine because it will make me shine with confidence! nothing is more beautiful than a confident woman and nothing spells confidence like this perfume.